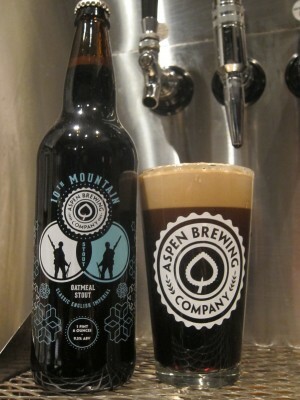 (Aspen, CO) - For the winter season, we at Aspen Brewing Company decided to bring back an old favorite, 10th Mountain Stout, our “Imperialized” version of a classic English oatmeal stout. Eight types of malt and a blend of American and English Hops were masterfully combined by Head Brewer Chase Engel to create a decadent beer worthy of sipping by the fire or sharing with friends on top of Highland Bowl. This brew pours black as a cold winter night and at 87 IBU & 9.3% ABV it’s powerful enough to keep you warm too! Cheers. Brewed and Bottled in Aspen, Colorado…downstream from nobody. 10th Mountain Imperial Stout is available in select liquor stores in the Roaring Fork Valley and Aspen Brewing Company’s tap room @ 304 East Hopkins Avenue, Aspen CO 81611.